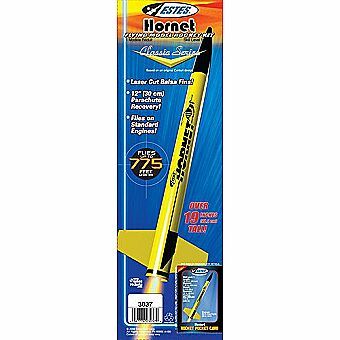 Back by popular demand, the Hornet is sure to be a crowd pleaser. Launched with standard engines this time around, this rocket can reach heights of 775 feet. A high quality wood nose cone, laser cut wood fins and waterslide decals mimic the original kit. Any changes Estes made only enhanced this classic rocket. A Skill Level 1 kit, building is straight forward with easy to follow instructions. Plan an afternoon to build and few hours to let that paint dry and before you know it, you will be on the flying field!